Enjoy our exciting online features, updated monthly! 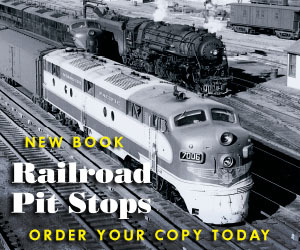 Railfan & Railroad explores the world of North American railroading, from steam to diesel, from freight to passenger, from yesterday and today. Railfan Extra Board explores the world of railroading from a different perspective every month. Railfan Photo Line is a monthly gallery of creative railroad photography submitted by our staff and readers. Keep up with the latest railroad news and information submitted by our staff and readers. Veteran newspaper journalist and magazine columnist Don Phillips explores the world of railroads and transportation policy as seen from Washington, D.C.
Just what does it mean to be a railfan? In Departures, consulting editor Alexander Craghead attempts to answer this question each month.